Building Good Teammates is the adult nonfiction title that expands on the concepts conveyed in Lance Loya’s children’s book Be A Good Teammate. Participation leagues, where every kid gets a trophy, lead to disillusionment. Not everyone wins in the real world. Yet, coaching kids to be ultra-competitive guarantees no greater probability of players becoming successful, well-adjusted members of society when their playing days have ended. 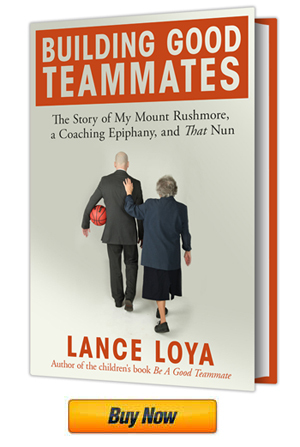 In Building Good Teammates, the author tells the story of how a “Mary Poppins-ish” nun inspires him to discover an alternative approach to coaching and to explore how his coaching methods were influenced by his unusual childhood and his personal Mount Rushmore—the four men who had the biggest impact on his life. Through the examination of the virtue of trust, a key component to being a good teammate, he explains how the coaches who impacted his life demonstrated how to have, build, and earn trust. Those three elements coincide with Loya’s three components of a good teammate—care, share, and listen. While teaching kids to be competitive can be beneficial, it is an endeavor that should take a back seat to teaching kids to be good teammates, a more valuable life skill. Everybody is part of a team in some capacity, and the world cannot have too many good teammates. When Sr. Eric Marie, a nearly 80-year old nun, joins Loya’s quest to build good teammates, the practices of the unassuming woman become the basis for the coach’s system. Loya explains how the Sisters of Mercy values of mercy, justice, hospitality, and service can be applied to using sports to teach kids to be good teammates. This book is a blueprint for using organized sports to teach kids a viable and sustainable skill that will serve them well for the rest of their lives. For personalized copies or bulk orders, please email info@coachloya.com.